Thirty-three years after his death, Fr. 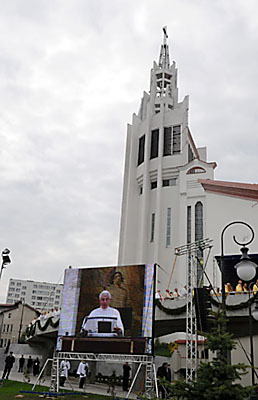 Sopocko (1888-1975) — the great promoter of the Divine Mercy message and a confessor of St. Maria Faustina Kowalska — was raised to the honors of the altar at a special beatification Mass on Sunday, Sept. 28, 2009 in Bialystok, Poland. 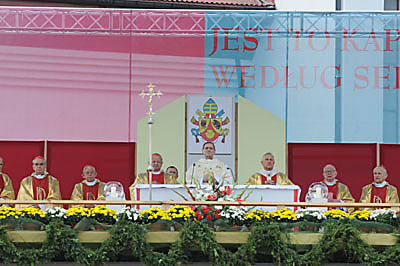 An estimated 80,000 people were on hand for the Mass, which was celebrated by His Excellency Archbishop Angelo Amato, prefect for the causes of saints and a personal delegate of the Holy Father Pope Benedict XVI. 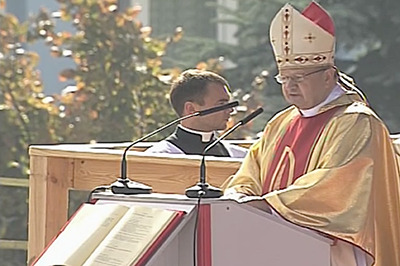 Cardinal Stanislaus Dziwisz, former secretary for John Paul II and present Archbishop of Krakow, Poland, gave the beatification homily at the Divine Mercy Church in Bialystok, where Bl. Michael Sopocko’s tomb is located. "There was a need for Fr. Michael’s wisdom, spiritual sensitivity, and holiness of life in order to recognize, in the visions of the simple nun, God’s message directed to the whole world," Cardinal Dziwisz said. Many Church dignitaries from various countries were on hand. Among them were Archbishop Metropolitan of Vilnius, Lithuania, Cardinal Audrys Juozas Backis; Archbishop Tadeusz Kondrusiewicz, Metropolitan of Minsk-Mohilev (Belarus); Metropolitan of Foggi (Southern Italy) Archbishop Francesco Pio Tamburino; and Apostolic Nuncio to Poland, Archbishop Jozef Kowalczyk. Participating in the celebration were more than 100 bishops, including Orthodox Archbishop Jakub of the Diocese of Bialystok-Gdansk; 400 priests; and more than 1,000 sisters, including 100 sisters from 13 countries from the Congregation of Merciful Jesus, the congregation founded by Fr. Sopocko. There were also pilgrimage groups from many countries, among them the Marian Helpers pilgrimage directed by Fr. Seraphim Michalenko, MIC. More than 80,000 faithful gathered on this fair September day with signs and colorful banners representing dioceses, parishes, and local church organizations. Among the distinguished guests were government officials headed by Lech Kaczynski, the president of the Republic of Poland, and Bronislaw Komorowski, the speaker of the Polish Parliament. Beatification of Fr. Michael Sopocko was requested by Edward Ozorowski, the Archbishop of Bialystok. Archbishop Angelo Amato read Pope Benedict XVI’s Apostolic Letter whereby Fr. Sopocko was raised to the rank of the blessed and received Feb. 15 as his liturgical day, the day of his death. 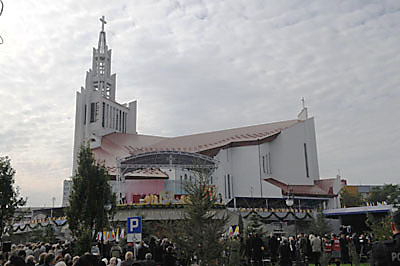 The procession with the relics of Blessed Michael Sopocko were carried by the rector of the Divine Mercy Shrine and by members of the Sisters of Merciful Jesus. The relics were placed in front of Blessed Michael’s image and were displayed for veneration. On the beatification image, Fr. Sopocko is depicted as a young priest, wearing a worn-out cassock signifying his simplicity and hard work, holding a rosary and a breviary, and with The Divine Mercy image hovering above his shoulder with the rays of mercy flowing through him. In his homily, Cardinal Dziwisz said "Divine Providence used this priest in order that the unchangeable truth of Divine Mercy would reach in a special way to the minds and hearts of people of the 20th century. That century characterized in a special way cruel totalitarian systems that tried to remove by force hope from the lives of the people, that tried to rip from them their dignity, condemning them to a sense of despair and meaninglessness. Among the dark moments of life, daily struggle with evil and difficult experiences associated with human life on earth, there was a need for a ray of light and hope. This ray was a powerful reminder of the truth that our destiny is in the hand of the merciful God. "Divine Mercy has its own face, this face is Jesus Christ, Son of God stooping over sinful man and feeding him with the word of truth and life and with the Sacrament of His Body and Blood," Cardinal Dziwisz continued. "It is the face of the One who leads us out of the dark world of sin and evil and leads us to the freedom of the children of God. It is the face of the One who became our Brother, and who said that we can recognize Him in the face of the hungry, the thirsty, the weary stranger, the naked, the sick and those in prisons. ’Whatever you have done to the least of my brothers, you have done to me’ (Mt 25:40). "Mercy has its own name. To this name, every knee shall bow," Cardinal Dziwisz said, "This name is Jesus and expresses the truth, that ’God saves.’ He saves every human person. That is why He waits upon all, even those who are lost the most, about whom today’s Gospel speaks. ’Truly I say to you, tax collectors and prostitutes are entering the Kingdom of God before you’ (Mt 21:31). For God, it is never too late. He always waits for our conversion. He waits for our hearts, He waits for our [extended] hands. He waits for us, that we may partake of His work of salvation. He waits, that when in need, we would remember and, like the second son of today’s Gospel, go to His vineyard. This is the message of mercy! This is our hope." involvement in this task, which was initiated by Sr. Faustina. He himself was a man of infinite trust in the mercy of God. This was his deepest spiritual attitude. This was his ’personal song.’ This was a special characteristic of his Christian and priestly identity." 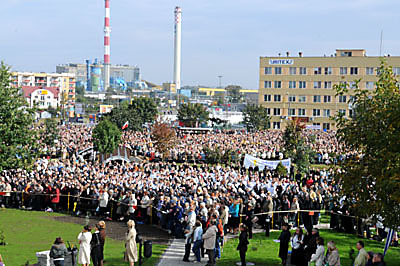 The Beatification date of Sept. 28 had a symbolic significance for the Archdiocese of Bialystok because on this day the archdiocese celebrates annually "The Day of Prayer for the Holiness of Priests." Around the altar of the beatification, there was a colorful banner quoting the words of Jesus to St. Faustina about Fr. Sopocko: "He is a priest according to my heart" (Diary, 1256). These words were also recalled by Archbishop Angelo Amato in his reflection. He spoke of their great significance and importance for priests. He urged priests to model themselves after the life of Blessed Michael Sopocko’s, a life given totally to Christ and the Church. I unite myself with joy with the Archdioceses of Bialystok and Vilnius and with all the faithful throughout the world to whom this message of merciful Jesus is dear. My beloved predecessor the Servant of God, John Paul II, most certainly rejoices in this beatification in Father’s house. He is the one who entrusted the world to Divine Mercy. That is why I repeat his wish: May the God who is rich in mercy bless all of you. In families, there is need for mercy every day; every day the wife must be compassionate with her husband and vice-versa, continually reconfirming their reciprocal fidelity. Every day parents must be magnanimous in forgiving their children, in experiencing their disobedience and their mistakes. But children, too, must be patient with their parents. Everyone in the family, at work, in society, everywhere and always, can exercise mercy, forgiveness, understanding: Our society needs honest, good, generous, compassionate citizens. After the celebration of the beatification Mass, the relics of newly Blessed Michael Sopocko were solemnly processed into the church of Divine Mercy and displayed for public veneration. At 3 p.m., the Chaplet of The Divine Mercy was sung in front of the exposed Blessed Sacrament. After the 3 ’clock hour and benediction, a solemn Mass of Thanksgiving was offered by the Archbishop Edward Ozorowski, the ordinary of Bialystok. Throughout the city, there were many cultural events associated with this beatification. 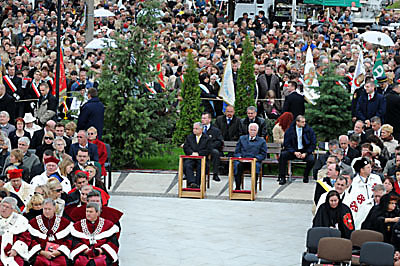 Children’s performances, concerts, choirs and other dramatic presentations were held in his honor. This was truly a joyful celebration, experienced by people from all over the world that attended this beatification in honor of this true servant of God, great promoter of The Divine Mercy alongside St. Faustina and the Servant of God John Paul II.